← Whole Lot Of Shakin’ Goin’ On!! Ralph’s appointment in Philadelphia was scheduled for noon. We were both up and ready, so we were on our way by about 11am. 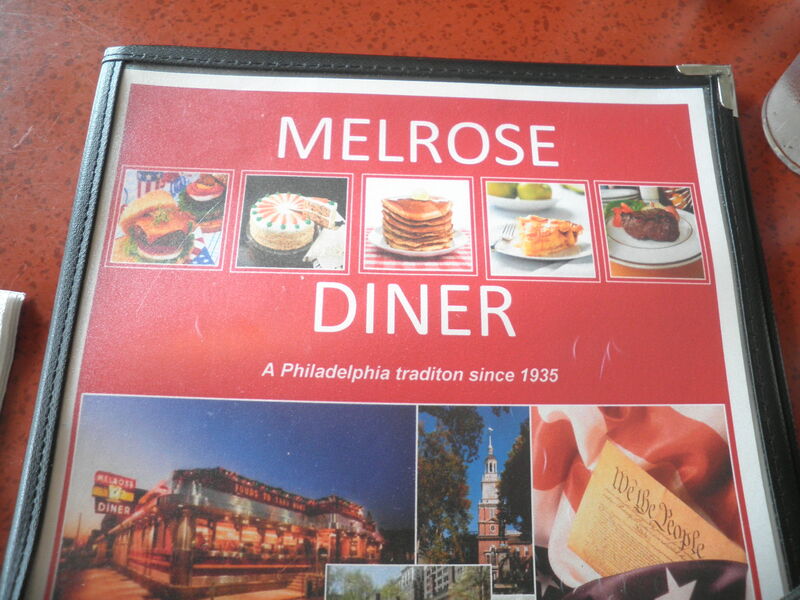 Since the office he was visiting was across the street from the Melrose Diner, our plan was for me to wait for him there until he was finished. To keep the waitress happy since I would be taking up a booth for a while, I ordered breakfast. 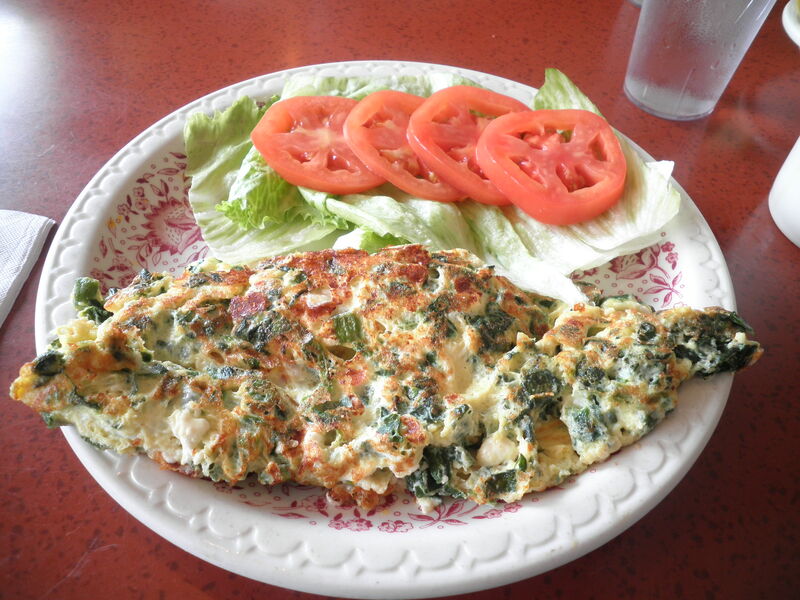 My choice-a spinach and feta cheese omelette with sliced tomatoes and dry rye toast. It was tasty and I was excited that they had orange marmalade for my toast. 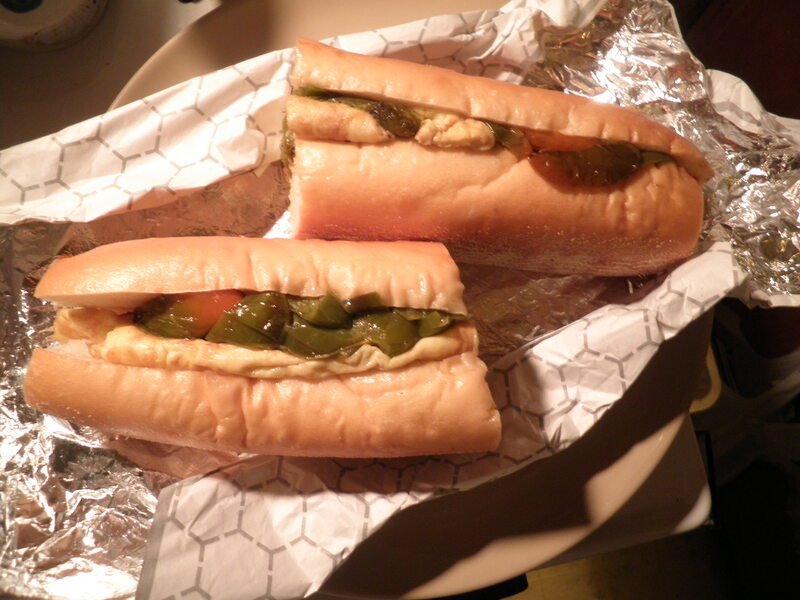 It’s so hard to find that in diners in NJ. I didn’t mind waiting because I had my book with me. I’m still working on Water For Elephants and still loving it!! It’s moving quickly and an extra hour of reading time was a nice gift. Especially when it came accompanied by coffee!! Ralph finished his appointment and joined me to have some lunch. He felt it was a productive meeting and he’s excited about it. When we got home I got my black beans out of the crock pot. 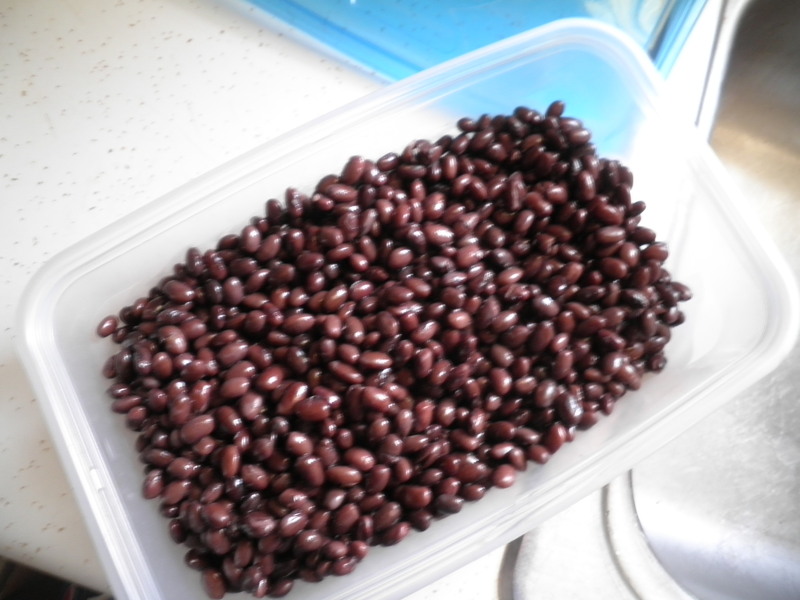 I just love having a nice batch of beans all ready and waiting for me in the fridge! Unfortunately, time got away from us when we got home, Ralph took a nap and I did a few things around the house. It was almost 7:30pm when we thought about eating. I didn’t feel like getting anything ready so Ralph took the quick trip around the corner to Picasso’s. Boring person that I am, it’s easy to guess what I asked for. 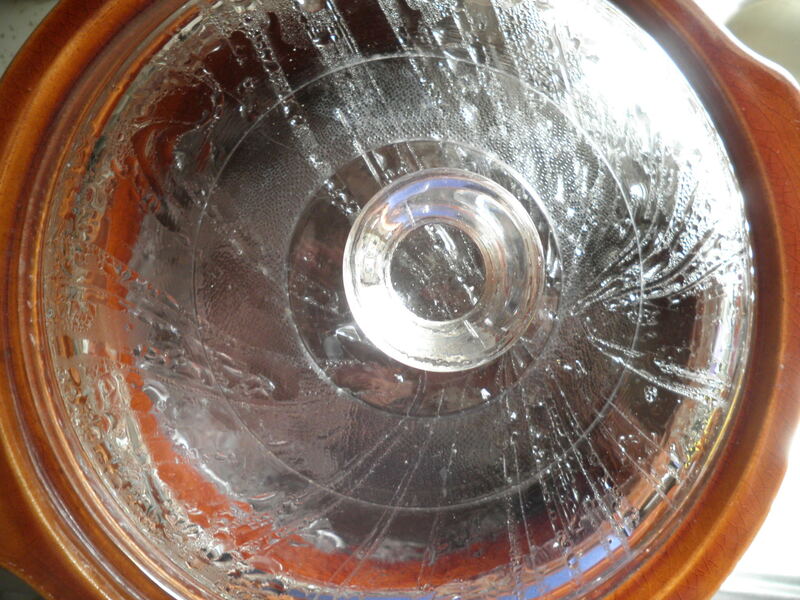 In an effort to be “artsy,” I took what I think is a cool photo of the condensation collecting inside my crock pot. It doesn’t translate quite as well as I would have liked, but hey…I love my crock pot and I’m not going to hide it!! So it’s Thursday and I’ve been awake since 2:30am. Could Not go back to sleep!! 😦 I tried. I was on my stationary bike by 4am, did my 40 minutes. I have plans today to get to the storage unit and get a lot more of what’s stored brought home. Hope I can stay wake to do that. I can always take a nap when I get home! On to a Productive Day! This entry was posted in Uncategorized and tagged beans, crock pot. Bookmark the permalink. Eggs are pretty much the perfect food. I keep deciding that I won’t eat them…but it never sticks. Someday I dream of having my own hens so that I can eat happy eggs. I’d feel better if I had my own chickens I think. Ralph’s brother used to have chickens that were just so cool. We had good eggs then, too! I wanted to love “Water for Elephants” but I just didn’t! Not sure what happened although I did like the movie much better. I eat eggs almost every day…love.them. I’m at the part in the book where the Elephant is being beaten and that’s not making me happy. I never saw the movie so I want to find out what’s happening. That’s sometimes why I end up finishing so-so books…I’m just nosy…I want to see what happens!